Carbonic anhydrases catalyze the reversible hydration of CO2. Since the discovery of this zinc (Zn) metalloenzyme in erythrocytes over 65 years ago, carbonic anhydrase has not only been found in virtually all mammalian tissues but is also abundant in plants and green unicellular algae. The enzyme is important to many eukaryotic physiological processes such as respiration, CO2 transport and photosynthesis. Although ubiquitous in highly evolved organisms from the Eukarya domain, the enzyme has received scant attention in prokaryotes from the Bacteria and Archaea domains and has been purified from only five species since it was first identified in Neisseria sicca in 1963. Recent work has shown that carbonic anhydrase is widespread in metabolically diverse species from both the Archaea and Bacteria domains indicating that the enzyme has a more extensive and fundamental role in prokaryotic biology than previously recognized. A remarkable feature of carbonic anhydrase is the existence of three distinct classes (designated α, β and γ) that have no significant sequence identity and were invented independently. Thus, the carbonic anhydrase classes are excellent examples of convergent evolution of catalytic function. Genes encoding enzymes from all three classes have been identified in the prokaryotes with the β and γ classes predominating. 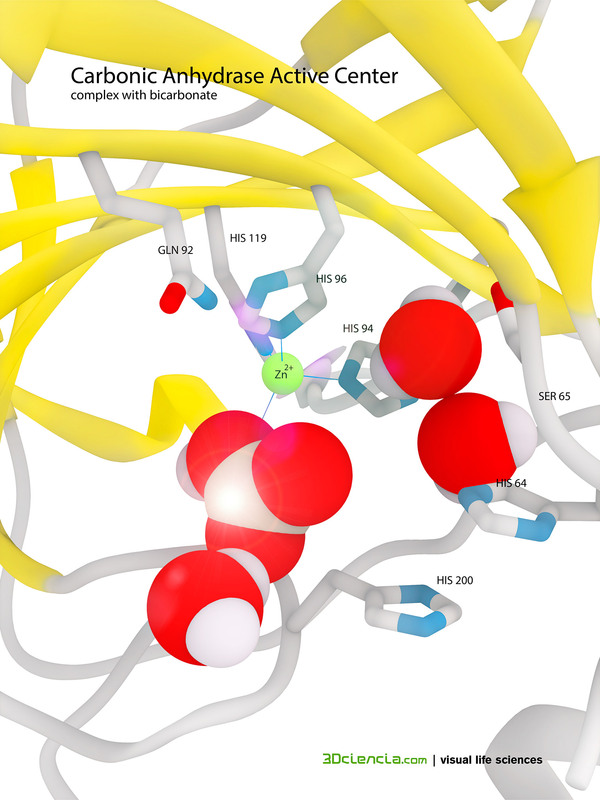 The kinetic properties of human isozymes CA I, CA II and CA III from the α class have been extensively investigated and follow a common ‘Zn-hydroxide’ mechanism for catalysis. The catalytically active group is the Zn-bound water which ionizes to a hydroxide ion. According to the proposed mechanism, the enzyme-catalyzed reaction occurs in two mechanistically distinct reactions. The first half-reaction is the interconversion between CO2 and HCO3− in which the rate is related to the steady-state parameter kcat/Km. The second half-reaction is the regeneration of the active form of the enzyme. This entry was posted in Chemistry, cover, Enzimas, Uncategorized. Bookmark the permalink.